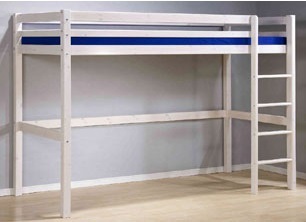 The overall height of your bed can also be adjusted by shortening the legs and ladder. The standard bed has an overall height of 180cm, and an underbed height of 140cm. Select Yes to height modification in the drop down box and then specify a new shorter overall height or underbed height in the comments section during checkout, and we will modify your bed to your chosen dimension.